Got our errands done before it started raining. Nay, pouring. But on the way home saw the Rain Bonnet Brigade. Dont know how many of my readers remember them, but all the women would keep rian bonnets in their purses. I know every once in a while I will still find one of my mom's floating around somewhere. 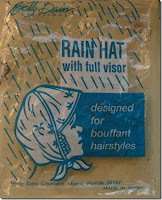 But usually the bonnets were freebies from drug stores and beauty supply stores. And the women kept them in their purse so if it rained, who cared about the rest of them - but their coiffed hair stayed dry! And here were 3 elderly ladies walking down the street in front of the senior housing, and they all had their bonnets on.....a very nice, nostalgic memory!!!! Still coughin - still tired - but feel much much better and my appetite is improving every day. Hopefully will get some more Disneyland photos posted soon!